With less than a month until the end of year, large cap US stocks continue to be the strongest asset class. The S&P 500 is up 13.7% year-to-date and it’s up 2.7% over the last month. The large cap index is solidly above the key 20-day, 50-day, and 200-day moving averages. In other words, the S&P 500 is in a bullish uptrend. As you can see, energy has been a huge drag on the performance of the S&P 500. It has underperformed the S&P 500 by nearly 10% over the last month. 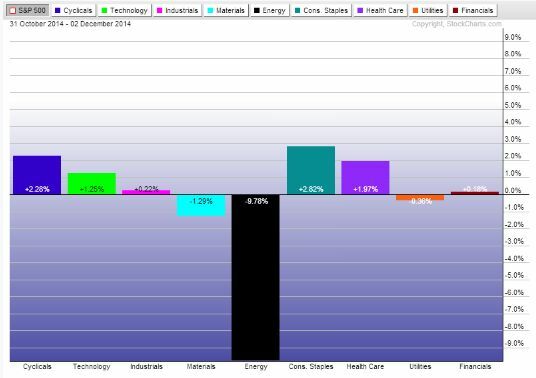 It’s the only sector that is down in absolute terms over the last month. Needless to say, the energy sector has been decimated by the 30% drop in oil prices this year. Not surprisingly, the strongest sectors have been ones that benefit from falling energy costs. Consumer related sectors have seen the biggest uptick. The selloff in energy looks to be overdone. It is clearly the most undervalued sector of the market right now. Over the last few days, we have seen some investors begin to buy energy stocks at a nice discount to where they were trading a few months ago. If oil prices rebound, they will make a nice profit as energy stocks come racing back. The problem is oil prices… any investment in energy would involve calling a bottom in oil prices. And the bearish downtrend for oil is still firmly in place. Trying to call a bottom in oil prices is akin to trying to catch a falling knife. More than likely you’re going to get hurt as it continues to fall. For now, it’s best to take a wait and see approach to the energy sector. At the very least, we need to see the fundamental situation of oversupply and weak demand change before it’s safe to call a bottom in oil.